PRISTINA, Kosovo (AP) — Germany’s foreign minister urged Kosovo’s political parties on Thursday to approve the border demarcation agreement with Montenegro to end their status as the only Western Balkan country without free travel rights in Schengen zone countries. 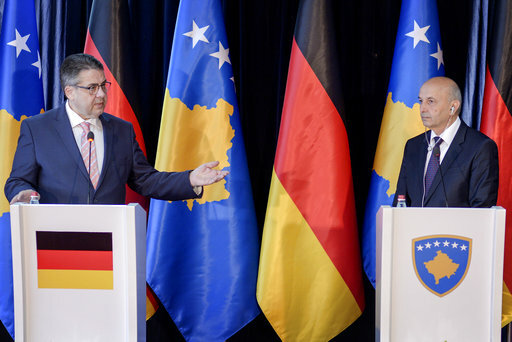 Minister Sigmar Gabriel was in Pristina on Thursday as part of his regional tour. Opposition parties say Kosovo loses territory in the border agreement signed two years ago, and have blocked the governing coalition from ratifying the deal by continuously disrupting parliament. U.S. Senator John McCain also visited Kosovo on Thursday, urging Pristina to resume its dialogue with Serbia, saying that’s the only way to a prosperous and safe future. “Taking ahead the dialogue … is in Kosovars’ and Serbs’ interest, vital for their joint European future and for the stability of southeastern Europe,” McCain said in a speech at the parliament. Kosovo declared independence from Serbia in 2008. It has been recognized by 114 countries but not by Serbia. Their relations have been especially tense since December following a series of provocations. Gabriel and McCain also called on Kosovo’s ethnic Albanian leaders to cooperate and convince the country’s Serb minority to approve the creation of the country’s armed forces. “Kosovo, like all other sovereign states, has the right to form an army but it should not be used to raise the emotional tensions,” said Gabriel. Kosovo President Hashim Thaci sent a draft law to parliament last month to transform the nation’s security force into a regular army, sparking concerns at NATO and the United States. Thaci bowed to international pressure and agreed to postpone the army transformation. Semini reported from Tirana, Albania.